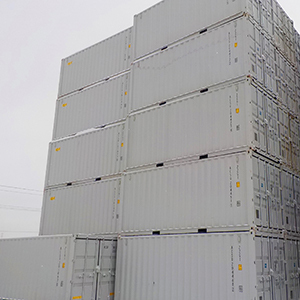 We are the largest retail container sales company in western Canada and we have the largest selection of intermodal containers on the ground. 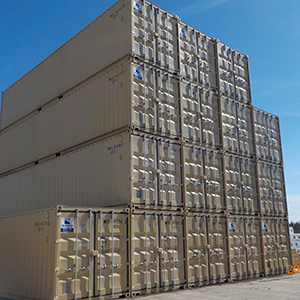 We have competitive pricing for any container, new or used, in any configuration. 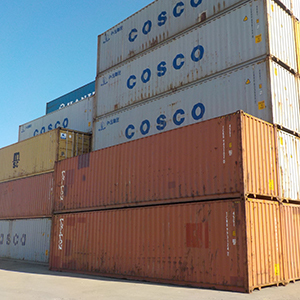 Sea-Can sells 8′, 9′, 10′, 20′, 40′, 45′, and 53′ steel intermodal containers. 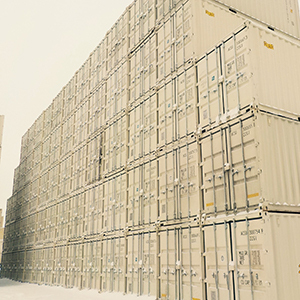 We own our own depot, stock several hundred containers in our own yard, and are northern Alberta’s largest distributor of steel shipping containers. 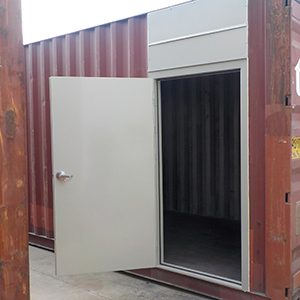 Sea-Can can provide shipping container customization by modifying your container to fit your specific need. We do custom container sizes, garage doors, man doors, roll-up doors, windows, HVAC, lighting and electrical. Contact us and let us know your specifications and we will make sure you get what you need. 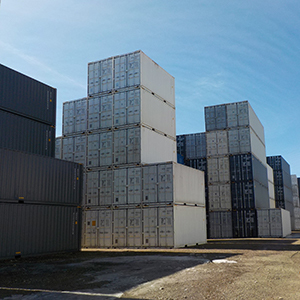 We also offer the choice to rent any of our used containers at low, competitive rates. 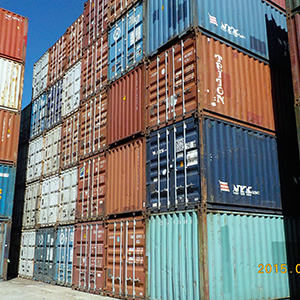 Sea-Can has a Certified Container Surveyor on staff so Sea-Can has re-certified containers for sale. Chemicals cannot be stored indoors due to Fire-Code and/or Hazmat regulations. Volatile Chemicals such as paints and fuels can be stored in Cargo Containers. This way they can be kept cool and secured. Construction sites often need Site Office and storage, but vandalism is a problem. 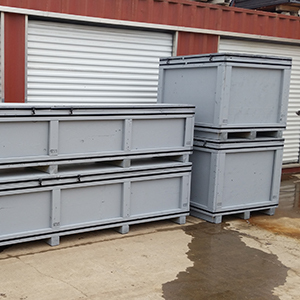 Construction, Plumbing and Electrical Contractors prefer used 20 ft marine containers for secure jobsite storage of tools and materials since containers are tough, inconspicuous and do not attract vandals. The new 10′ are great for excavations and downtown jobs where room is tight. We have recently received 8′ 9′ AND 10′ mini boxes which should be ideal for sub trades who go floor to floor. Construction tool shed containers and site office containers are easily placed on a confined jobsite with a crane truck or tilt deck truck. Cargo Containers are harder to break into than many site buildings. Small 6ft and 8ft containers can be moved around job site to where they are needed. Problem – Old documents and files need to be kept for 7 years for tax reasons. Solution – Cargo Containers provide dry storage for your records. Insulation, custom shelving, vents, heat and lighting are available. Interior shelving helps with organization. If your business relocated archive records are already packed and ready to go. Community emergency planners need a disaster and vandalism resistant building for equipment. Community associations have purchased containers for storage of earthquake preparedness kits at elementary schools. Sea-Can works with these customers to select high quality units, and arrange delivery. Problem – Power Generation is needed at a remote industrial or construction site. 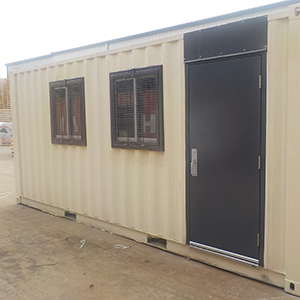 Solution – Gensets up to 1500 KW are easily housed in shipping containers, providing reduced outside noise, simple shipment to the site and a durable, complete unit for the user. 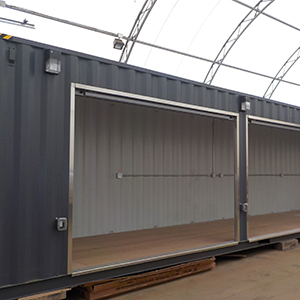 20ft containers with doors in each end and a center dividing wall to form two 8ftx10ft cubicles. 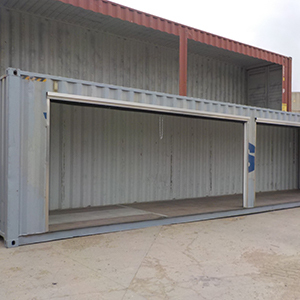 40ft containers can be fitted with roll up doors along the side and wall dividers to make five 8ft mini storage units.